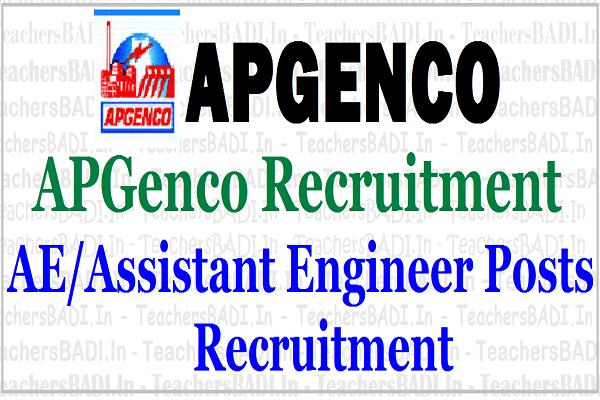 APGenco AE/Assistant engineers Recruitment Selection list Results 2017(Provisional)/APGENCO Recruitment 2017/APGENCO AE/Assistant engineers recruitment 2017, Results/Merit List/APGenco AE/Assistant engineers Recruitment, Hall tickets, Results 2017/ APGenco AE/Assistant engineers Recruitment Results 2017 announced on May 16: APGENCO is going to release the 94 #AE/ Assistant Engineer Posts 2017 Recruitment Notification on 03 March 2017 and AP State Power Generation Corporation Limited (APGENCO) would invite the #onlineapplications from the eligible and qualified candidates for the post of Assistant Engineers (Electrical., Mechanical, Electronics and Civil). About: Andhra Pradesh Power Generation Corporation Limited is one of the pivotal organizations of Andhra Pradesh, engaged in the business of Power generation. Apart from operation & Maintenance of the power plants it has undertaken the execution of the ongoing & new power projects scheduled under capacity addition program and is taking up renovation & modernization works of the old power stations. Applicants must possess the qualifications from a recognized University as detailed below or equivalent thereto as specified in the relevant Service Rules, intended by APGENCO as on the date of Notification. 1. Electrical - Must possess B.E/B.Tech/A.M.l.E., Electrical & Electronics Engineering or equivalent qualification from any recognized University in India as on 01.03.2017 under regular basis. 2. Mechanical - Must possess B.E/B.Tech/A.M.l.E., Mechanical Engineering or equivalent qualification from any recognized University in India as on 01.03.2017 under regular basis. 3. Electronics- Must possess B.E/B.Tech./A.M.l.E., in Electronics & Communication Engineering/ Instrumentation & Controls Engineering/ Electronics & Instrumentation Engineering/ Electronics & Control Engineering/ Instrumentation Engineering/Electronics Instrumentation & Power/ Power electronics I Computer Science Engineering/Computer Science & information Technology or equivalent qualification from any recognized University in India as on 01.03.2017 under regular basis. 4. Civil - Must possess B.E/B.Tech/A.M.1.E., Civil Engineering or equivalent qualification from any recognized University in India as on 01.03.2017 under regular basis. 1. The OC candidates Should pay an amount of Rs.500/-(Rupees five hundred only) (non-refundable) (Rs.350/- towards examination fee and Rs.150/- towards application registration fee). 2. Physically Challenged (having a disability of Should pay an amount of Rs.150/-(Rupees one hundred and more than 40% and above) and candidates fifty only) (non-refundable) towards application registration belonging to BC, SC & ST communities fee. 3. Candidates belonging to other States Should pay an amount of Rs.500/-(Rupees five hundred only) (non-refundable) (Rs.350/- towards examination fee and Rs.150/- towards application registration fee). How to Apply: The candidate has to login to the website http://www.apgenco.gov.in and click on APPLY ONLINE link or directly visit http://apgenco.cgg.gov.in to view detailed notification, user guide and to submit an application form. Online application is accessible from 06.03.2017 to 05.04.2017. 1. Starting date for Payment of Fee and Application submission is: 06-03-2017. 4. Hall-tickets can be downloaded 07 days before commencement of Examination.